I am a university-educated and professionally experienced multilingual translator and interpreter for English, Spanish, and German with a specialization in politics, marketing, economics, and international affairs. In the course of my studies and career, I have gained extensive work experience and intercultural knowledge living in Spain, England, the USA, and Germany. After working as an in-house translator for embassies in Washington, DC, and Berlin (Germany), I founded my own business to pursue my career as a freelance translator and interpreter. My clients have included the streaming service Netflix, the U.S. Department of State, the Hanns-Seidel Foundation in Washington, DC, the Friedrich-Ebert Foundation, Indiana University, the Peruvian Embassy in Berlin (Germany), the Austrian Embassy (Washington, DC), the University of Leipzig (Germany), and others. Much to the chagrin of many dedicated and excellent interpreters and translators around the world, the translator profession is not protected in the same way as most other professions. As a result, many individuals that do not possess the necessary qualifications nor expertise may work as translators and/or interpreters, since clients often don't check/notice the difference in quality in a foreign language. Due to the fact that the general public has not been provided with enough information about the translation business, people looking for a translator or interpreter often think that machine translations will do the trick (they won't) or that anybody can translate well. Therefore, clients frequently hire cheap "translators" that produce poor-quality and even incomprehensible translations. Poor translations on your website will result in damage to your reputation as a business, individual or organization. Just think how you would feel if you saw a website of a business that was poorly written and contained a plethora of grammatical mistakes. Would you hire a business like that or trust that individual to provide a quality service for you? Probably not. Good translations require research, thoroughness, and dedication. Translators should only translate into their native language(s) in order to ensure optimal results. My translation and interpreting services are based on thorough preparation, research, terminology work, and attention to detail. The heart of this book is constituted by the scientific discipline of neurolinguistics. 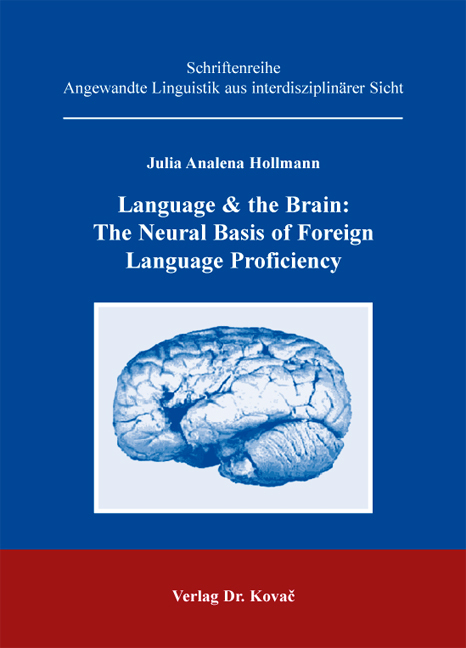 The fascinating field of neurolinguistics encompasses the study of the neural mechanisms in the human brain that control the comprehension, production, and acquisition of a native or foreign language. Neurolinguistic research examines the underlying mechanisms of all the major subcategories of language in the brain, e.g. syntax, semantics, phonetics, phonology, or morphology/lexicology, each of which exhibits a distinct neural basis in the brain. Unfortunately, previous research on differences in foreign language (L2) proficiency has concentrated primarily on age-related variables and neglected to examine why there are still striking individual variations even after age-related variables (e.g. age of arrival, length of residence) have been accounted for.